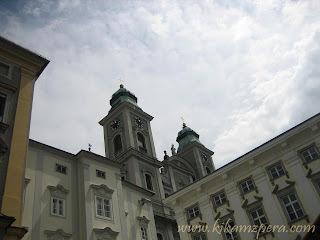 Our third day in Austria brought us to Linz, a good hour and a half drive from Vienna. Linz today is a bustling industrial city but the Old Town is a must see for tourists for its many historic buldings and monuments. When we got there, our feet took us to the Hauptplatz, where there was a festival going on. People were dressed in Middle Age costumes and there was a festive air all around. Of course, I didn't miss the medieval square, which is bordered by splendid Baroque facades. And there was the Alter Dom (the Church of St. Ignatius) in Baroque style which boasts a wonderfully ornate pulpit and altarpiece. 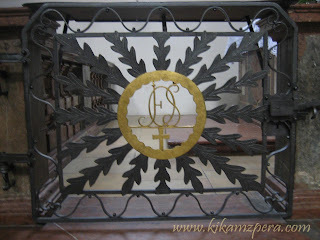 Seeing this church was special to me owing to the fact that I was educated in a Jesuit run school when I was in college. And St. Ignatius is one of my favorite saints because his life story inspired and touched me. 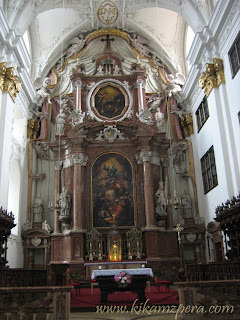 The opulent Baroque altar at the Church of St. Ignatius. 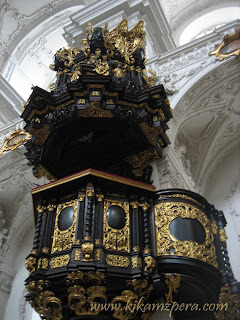 L: The equally ornate pulpit with gold carvings on black wood. 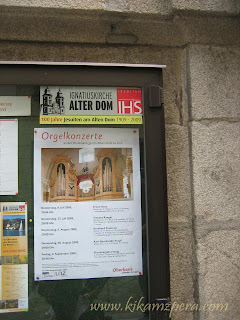 R: An Organ Concert announcement. R: Steeple of the Alter Dom (St. Ignatius Church) as seen from the Hauptplatz.